Two-Color Gold, 11.61 carats Colombian Emerald and Diamond Ring. Estimate 35,000 — 45,000 USD. Photo: Sotheby’s. 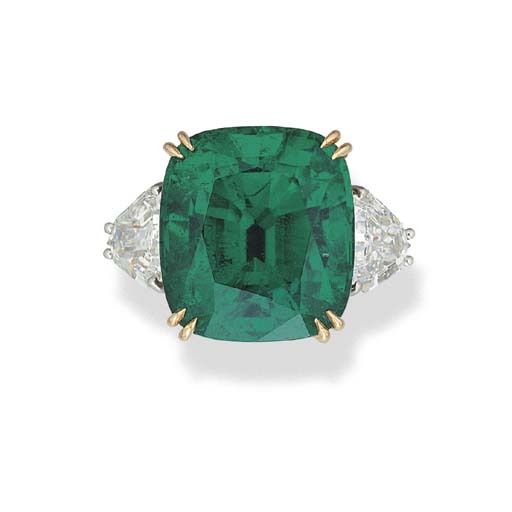 Centered by an octagonal step-cut emerald weighing 11.61 carats, flanked by two half moon-shaped diamonds weighing approximately 3.00 carats, size 6¼ . Accompanied by AGL report no. 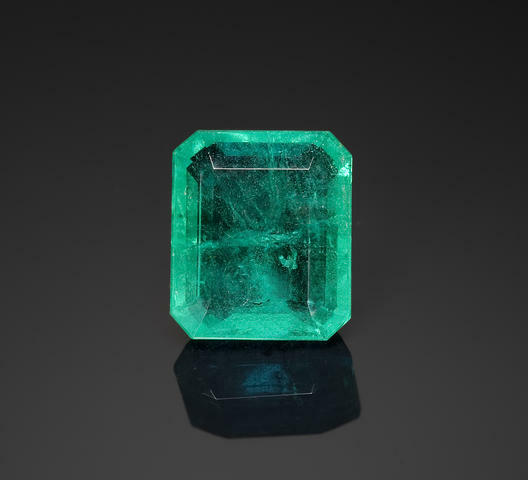 CS 64498 stating that the emerald is of Colombian origin, clarity enhancement: moderate, type: modern. Accompanied by GIA report no. 2165659075 stating that the emerald is of Colombian origin, clarity enhancement: moderate. Platinum, Colombian Emerald and Diamond Ring. Estimate 60,000 — 80,000 USD. Photo Sotheby’s. 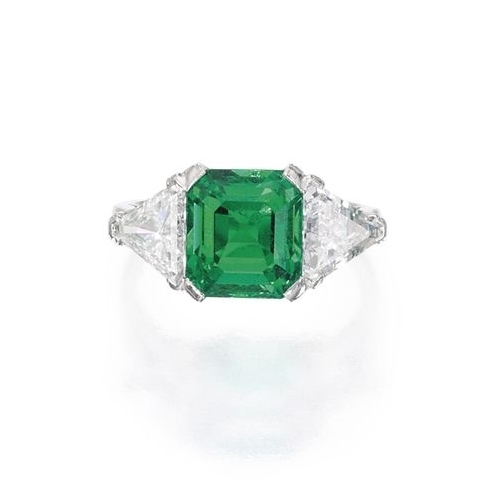 Centering an emerald-cut emerald measuring approximately 9.2 by 8.4 by 6.6 mm, flanked two triangle-cut diamonds weighing approximately 1.20 carats, further set with baguette diamonds weighing approximately .15 carat, size 6. Accompanied by AGL report no. CS 64236 stating that the emerald is of Colombian origin, clarity enhancement: minor, type: traditional. 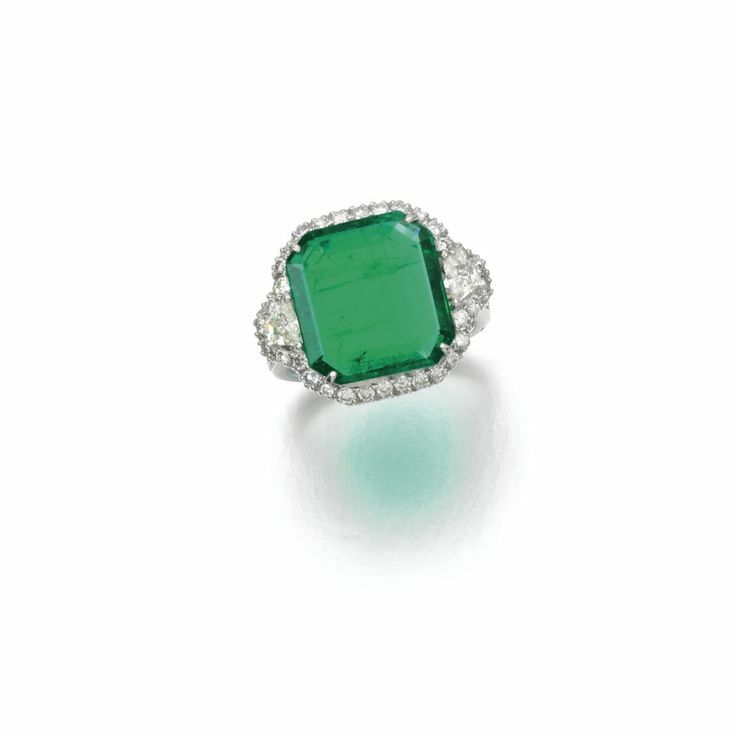 Superb 18.54 carats Colombian emerald and diamond ring, Van Cleef & Arpels, New York, 1968. Photo Sotheby’s. Accompanied by AGL report no. 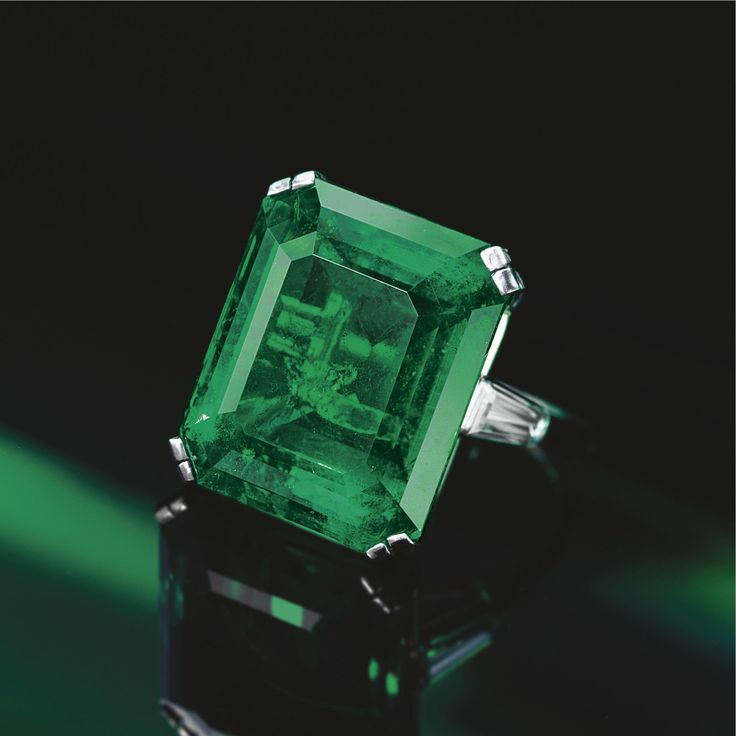 CS 38757 stating that the emerald is of Classic Colombian origin; insignificant gemological evidence of clarity enhancement present (oil type treatment). 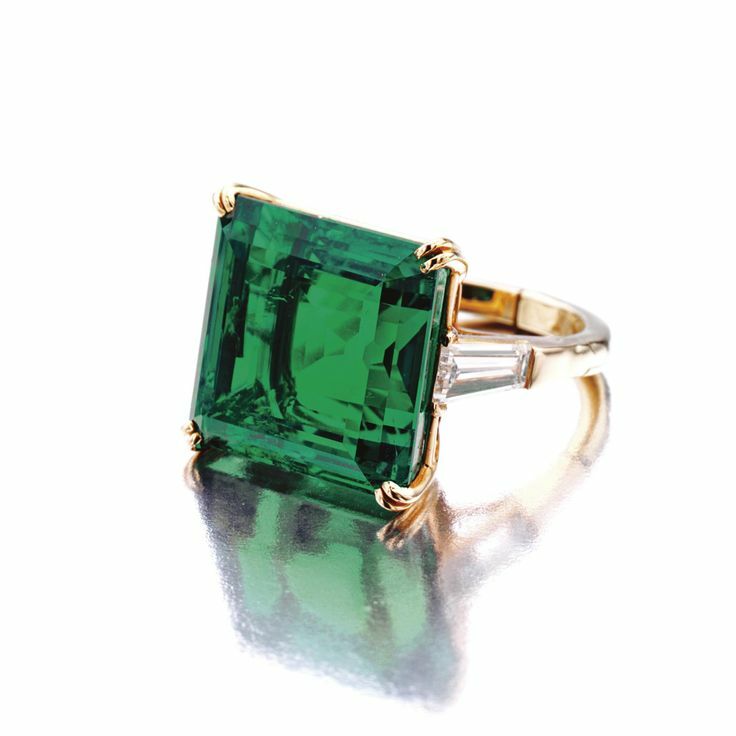 « The 18.54 cts square faceted emerald which you have just purchased through us, came originally from the collection of an Indian potentate known for his love of fine and unique gems. Letters from Louis Arpels dated August 8, 1968 and from their consultant on this sale, R.V. Sullivan of Vartanian & Sons, Inc., dated July 31, 1968, also attest to the exceptional quality of the stone. 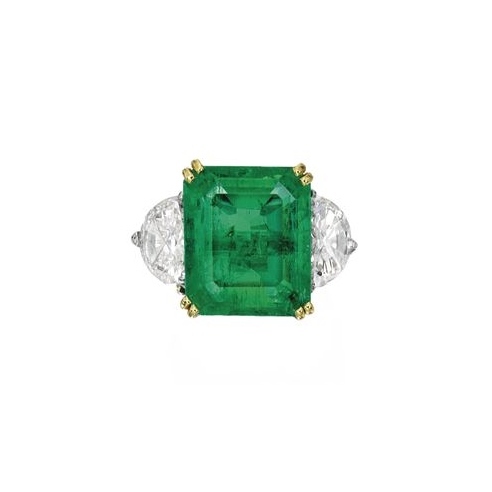 29.63 carats Colombian Emerald and diamond ring, Harry Winston, 1977. Photo Sotheby’s. PROVENANCE: Property of Bernice Chrysler Garbisch, Sotheby’s, New York, October 14, 1976, lot 232. Accompanied by AGL report no. CS 37211 (duplicate) stating that the emerald is of Classic Colombian origin; faint clarity enhancement (oil type treatment/Canadian balsam). 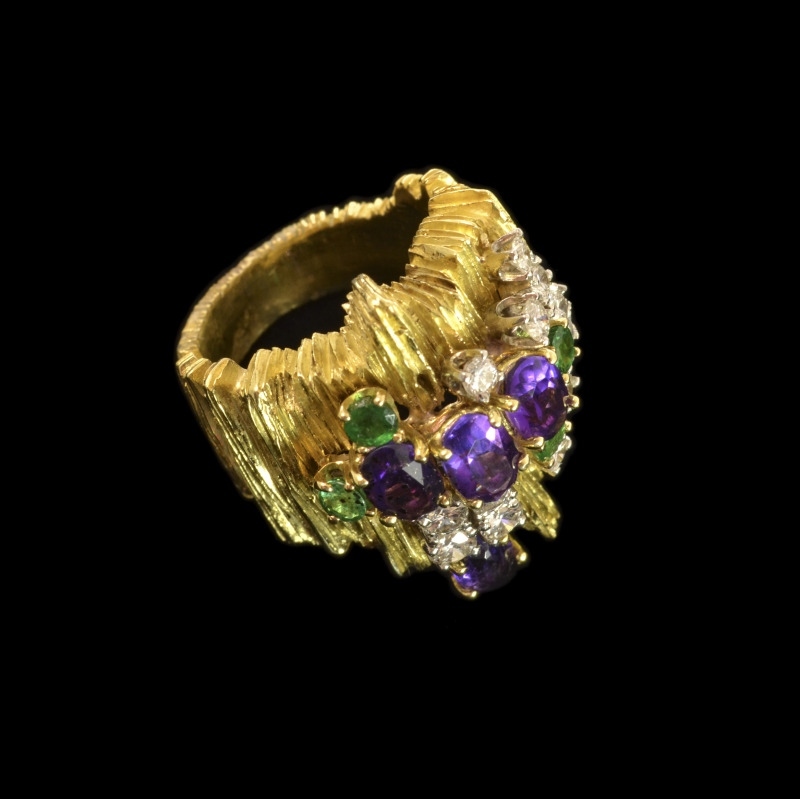 18k gold, amethyst, emerald and diamond ring, Henry Dunay, circa 1970s. available at Mahnaz Collection. email mahnaz@mahnazcollection.com. Set with a step-cut emerald, to a mount set with trapeze-shaped and brilliant-cut diamonds, size L.
Accompanied by AGL report no. CS 47207, stating that the emerald is Colombian, with insignificant clarity enhancement. 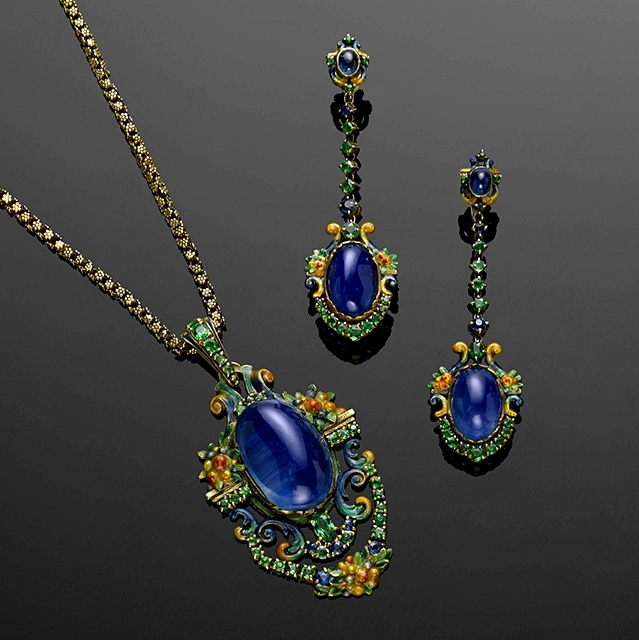 A sapphire, demantoid garnet and enamel suite, Attributed to Louis Comfort Tiffany, Tiffany & Co., circa 1920. Sold for US$ 161,000 (€130,164). Photo: Bonhams. NEW YORK, NY.- Intense and competitive online and telephone bidding brought the Fine Jewelry auction to a triumphant close, with sales totaling nearly $4.1 million. Colored gems, classic designs, and signature pieces performed fantastically. An exquisite diamond ring by Cartier, weighing 8.45 carats. Sold for US$ 293,000 (€236,882). Photo: Bonhams. 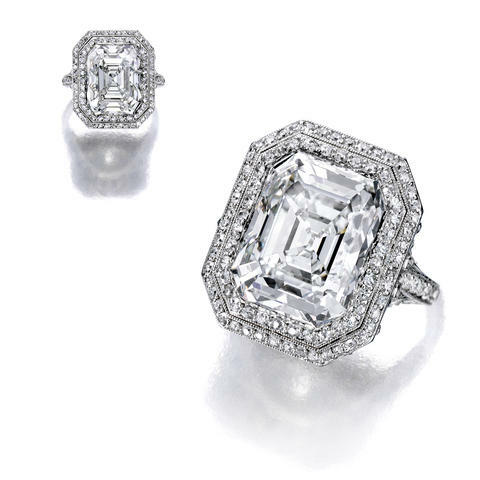 Accompanied by GIA report #1162755942, dated November 5, 2014, stating the center diamond as: I color, VS1 clarity. Notes: Founded in 1900, Weyerhaeuser is today one of the world’s largest forest products companies. A venerable Northwest business, they sustainably grow and manage timberlands in the United States, Canada, and Uruguay, and manufacture wood and cellulose fiber products. 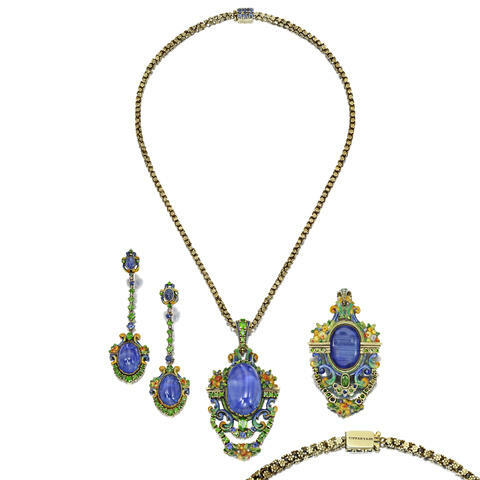 A rare antique Renaissance Revival suite of sapphire, demantoid garnet and enamel jewelry by Louis Comfort Tiffany for Tiffany & Co., circa 1920. Sold for US$ 161,000 (€130,164). Photo: Bonhams. Pendant accompanied by AGL report #CS 64374, dated November 13, 2014, stating the sapphire as: Ceylon (Sri Lanka) origin, no indications of heat or clarity enhancement. Ear pendants accompanied by AGL report #CS 64373 A and B, dated November 13, 2014, stating the sapphires as: Ceylon (Sri Lanka) origin, no indications of heat or clarity enhancement. Notes: With its vivid blue and intense green color scheme, and its irregularly-domed, color-saturated sapphires, this suite features one of Louis Tiffany’s favored palettes, and exemplifies his preference for gemstones left as close as possible to their natural forms. The closely corresponding Renaissance style necklace (with related sketch #F5197) shown on pp. 134-5 and back cover of Janet Zapata’s The Jewelry and Enamels on Louis Comfort Tiffany is strongly related to this suite in form, materials, motifs and palette. Further, an enamel and lapis necklace dated 1920, pictured on pp. 86-87 of Louis Comfort Tiffany at Tiffany & Co., by John Loring, incorporates highly comparable enamel floral elements. Also, as with the majority of Tiffany’s work, the reverse of this pendant is partially enameled. With its Renaissance form and baroque flourishes such as c-scrolls and formal floral bouquets, the suite demonstrates Tiffany’s interest in historicism and revival styles during the decade of 1910-1920. It was a period during which major collectors like J.P Morgan and Lockwood DeForest (a friend of Louis Tiffany) were amassing historical jewelry from Renaissance Europe, India and other civilizations. These collections were important sources of creative inspiration for Tiffany. This historicist influence was already evident in Tiffany’s critically acclaimed Etruscan jewelry of 1906, and in the progression of subsequent jewels in the Indian, Hellenistic and Byzantine styles. The so-called Mogul necklace, featuring a cabochon sapphire pendant on a silk cord, and the neo-Egyptian bracelet, set with Maine tourmalines, represent a couple of his most successful designs as a jeweler. Although he became more interested in establishing his Foundation, leaving less time for the artistic direction of the firm, Tiffany continued to design jewelry, according to John Loring, until he closed the glass furnaces in 1924. Under Tiffany’s influence, the jewelry department overseer from 1914-1933, Meta Overbeck, was also incorporating these historical references into the firm’s work. Her design drawings, preserved at the Charles Hosmer Moore Museum of American Art in Florida, contain sketches for jewelry similar to this suite in form and motif. Sketches for analogous pieces appear on page 15 and on preceding pages of her design book, among the series numbered F5100-F5300. After nearly a century later, it is unusual to find such a suite of jewelry intact; one which reflects the unconventional jewels that Tiffany offered their affluent patrons. 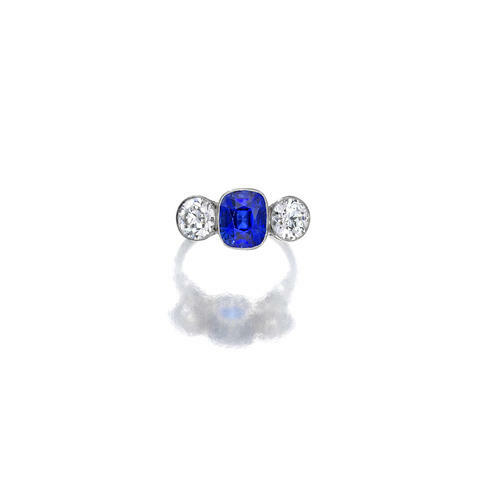 A Kashmir sapphire and diamond ring that fetched $118,750 (€96,006), almost twice the high estimate. Photo: Bonhams. Accompanied by AGL report #CS 63499, dated October 7, 2014 stating the sapphire as: Kashmir origin, no indications of heat or clarity enhancement. A Burma sapphire and diamond brooch with a diamond weight of 6.85 carats, sold for US$ 112,500 (€90,953), an impressive 9 times the high estimate. Photo: Bonhams. 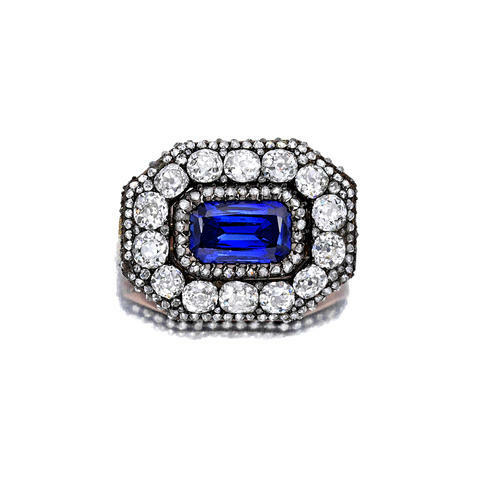 centering a cut cornered rectangular step-cut sapphire, within an old mine-cut diamond surround, enhanced by rose-cut diamonds; estimated total diamond weight: 6.85 carats; mounted in silver topped 14k rose gold; length: 1 1/4in. Accompanied by AGL report #CS 64337, dated November 13, 2014, stating the sapphire as: Burma (Myanmar) origin, no indications of heat or clarity enhancement. A Colombian emerald and diamond ring, featuring a large emerald cabochon weighing approximately 50 carats surrounded by diamonds. It achieved $106,250 (€85,900), over 3.5 times the high estimate. Photo: Bonhams. 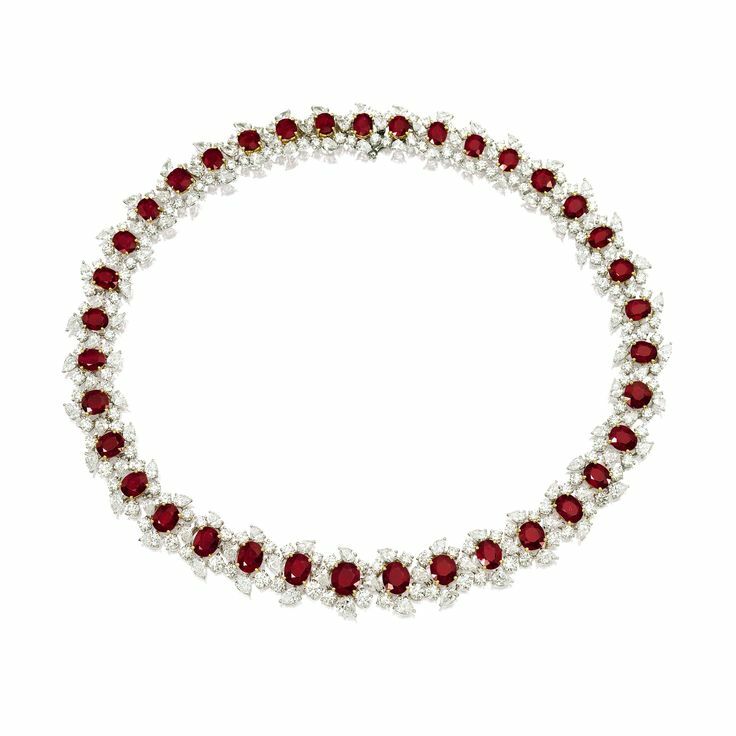 A late art deco Burma ruby and diamond bracelet, circa 1935, with a total diamond weight of 14.00 carats, which sold for $106,250 (€85,900), well past its high estimate. Photo: Bonhams. 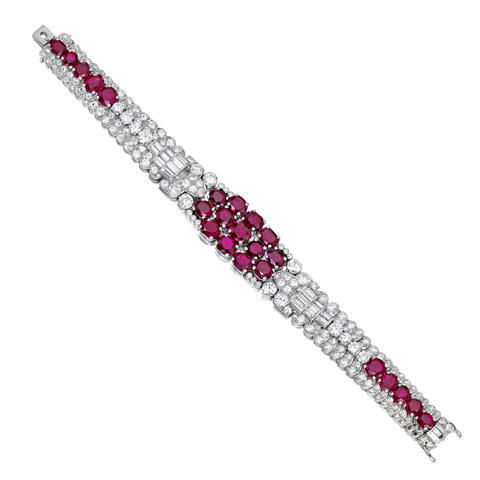 designed as a tapering circular-cut diamond tapering band, enhanced by baguette-cut diamond detail, centering oval and circular-cut ruby clusters; estimated total diamond weight: 14.00 carats; mounted in platinum; length: 6 3/4in. Accompanied by AGL report #CS 64376, dated November 13, 2014, stating the rubies as: Classic Burma (Myanmar) origin, no indications of heat or clarity enhancement. 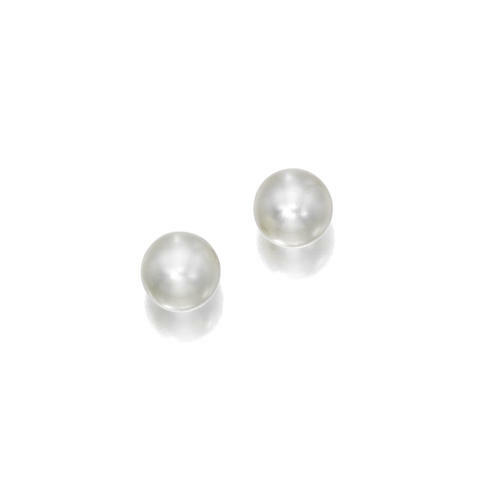 A pair of natural button pearl diamond ear studs, each over 10mm, realizing $45,000 (€36,381), close to 6.5 times its high estimate. Photo: Bonhams. Passed through the family by descent from the Estate of a New York Socialite. The next Fine Jewelry sale will take place in New York in April 2015. A selection of jewelry from the Estate of Lauren Bacall will be offered at auction as part of The Lauren Bacall Collection on March 31 and April 1 of 2015. This attractive emerald-cut stone has a very pleasant blue-green hue which is so sought-after. The degree of saturation of an emeralds is always the most important consideration when selecting a stone as is the absence of yellow and this stone meets both those criteria. 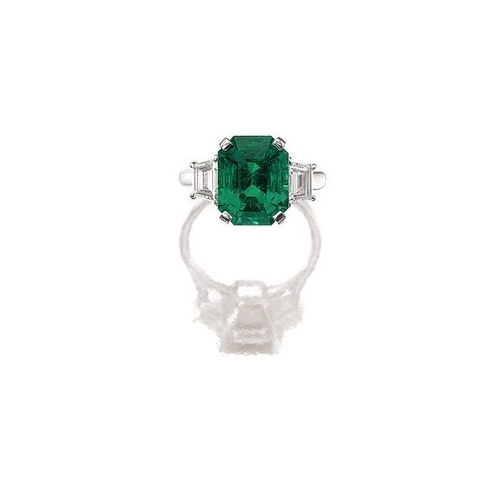 Accompanied by a Gemological Institute of America report number 2151652544 dated September 12, 2013 stating that the 11.03 carats emerald has moderate indications of clarity enhancement. Due to their growth conditions in nature and recovery methods, most emeralds contain surface reaching features. For this reason, clarity enhancement is a common trade practice. 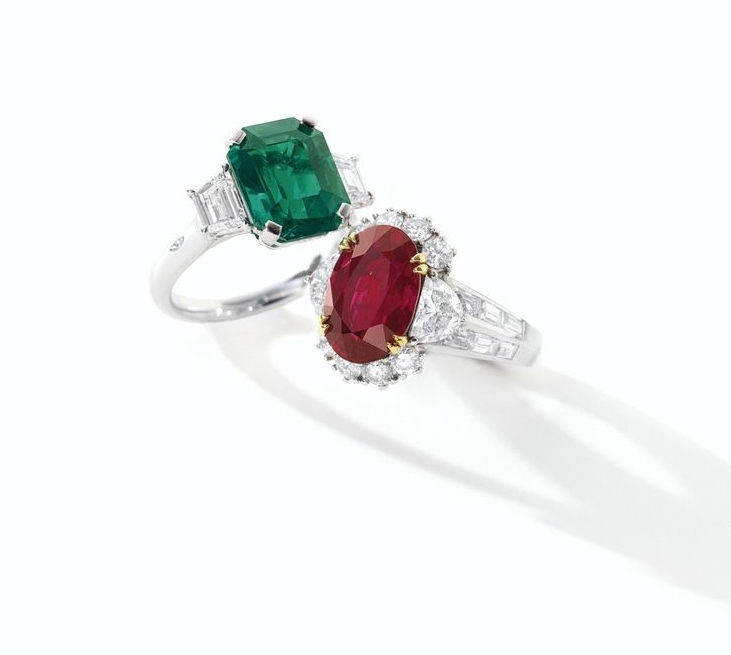 A fine 4.81-Carat Colombian Emerald and Diamond Ring with No Oil Enhancement & A fine 4.79-Carat Unheated “Pigeon’s Blood” Mogok Burmese Ruby and Diamond Ring, Cartier. Photo: Sotheby’s. 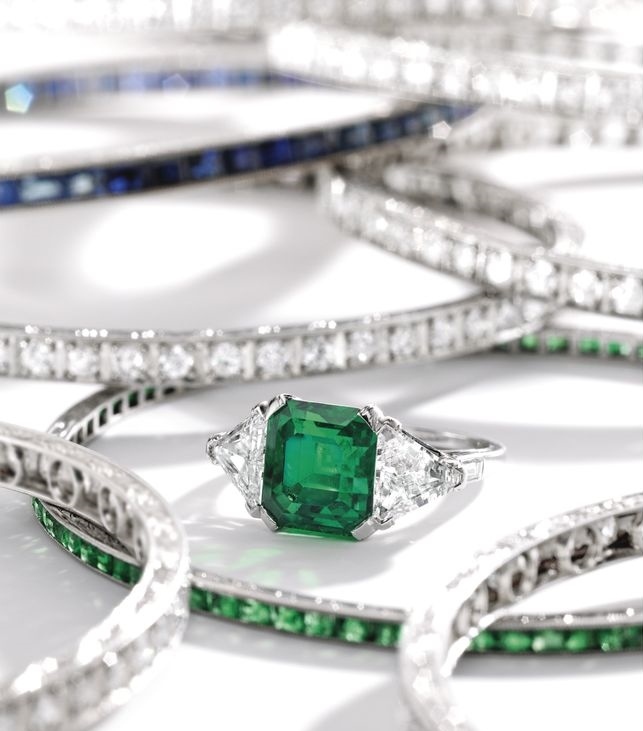 HONG KONG.- Following last December’s success, Sotheby’s Hong Kong Fine Jewels and Jadeite sale this year will take place on 27 November 2014 at Sotheby’s Hong Kong Gallery, featuring an array of coloured and colourless diamonds, gemstones, and beautiful signed jewels highlighted by the iconic Cartier “Tiger” brooch. The sale will also include a charity session featuring 11 lots of whimsical jewels and watches to benefit Operation Smile China Medical Mission#, a charity that provides free surgery to underprivileged children and young adults with cleft lips or palates in China. Including the charity session, the entire sale will offer a total of 180 lots with a total estimate in excess of HK$58 million / US$7.5 million*. Inspired by the brand’s director of haute joaillerie Jeanne Toussaint, Cartier’s portrayal of the tiger is a timeless classic, highly sought after by style icons and jewellery collectors, in particular Barbara Hutton – Woolworth heiress, renowned jewellery collector and original owner of the Hutton-Mdivani Jadeite Necklace which sold for a record-setting US$27.44 million at Sotheby’s Hong Kong in April 2014. 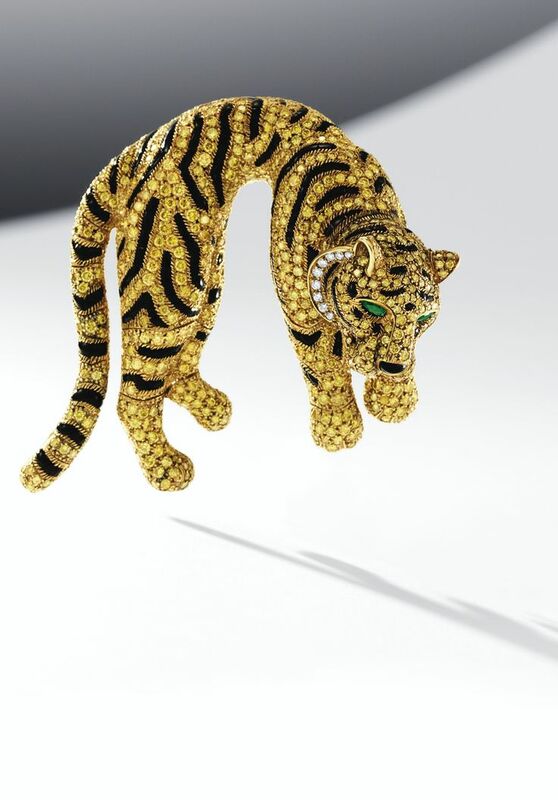 One of the jeweller’s most loyal patrons, Hutton favoured the tiger over the iconic panther, and in 1957 commissioned Cartier to create a three- dimensional “Tiger” clip brooch set in yellow diamonds, striped with onyx, and a pair of earrings to match, which has become a celebrated motif from Cartier’s exquisite “Great Cat Jewels”. 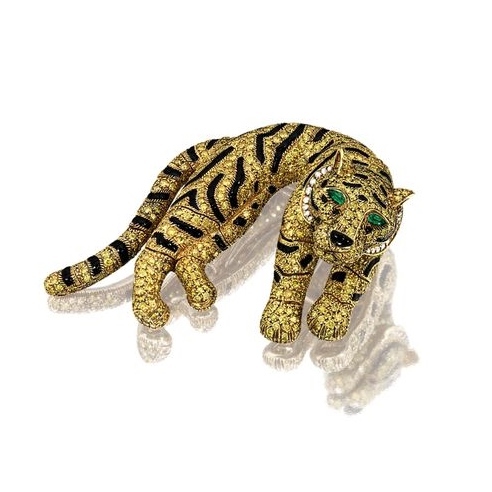 The craftsmanship of this “Tiger” clip brooch, a later version similar to the famous example commissioned by Barbara Hutton, is likewise close to perfection, with piercing emerald eyes and legs and tail articulated to move with the body resting in a composed curl. Charming Yellow Diamond, Diamond, Onyx and Emerald ‘Tiger’ Clip-Brooch, Cartier. Estimate HK$1,200,000 — 1,600,000 / US$150,000 – 200,000. Photo: Sotheby’s. 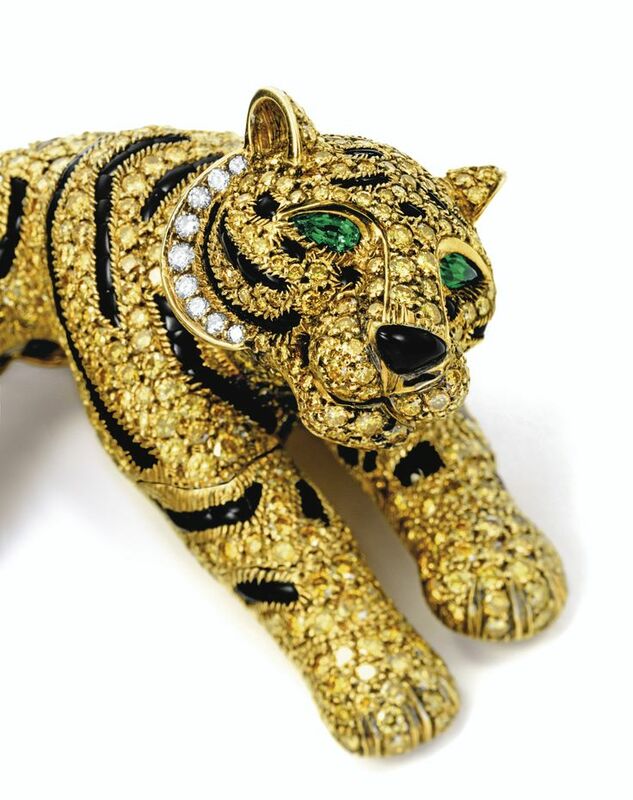 Modelled as a tiger, set with brilliant-cut yellow diamonds and diamonds together weighing approximately 9.95 carats, speckled by onyx, embellished by pear-shaped emerald-set eyes, mounted in 18 karat yellow gold, signed and numbered 754922. Accompanied by Cartier report and signed box. The charismatic charm of the tiger and the human imagination of this enchanting creature have been featured prominently in ancient mythology, folklore, and in modern art and literature. A tiger’s prowess stirs up a thousand stories in children’s literature and film – The Life of Pi by Yann Martel, the muscular body with distinctive vertical black strips, depicted as such in a fine Chinese Painting by Zhang Shanzi, and notably in jewellery design, the graceful and majestic beauty of a tiger as interpreted in Cartier’s ‘Great Cat Jewels’. Amongst the exquisite ‘Great Cat Jewels’ collection, inspired by Cartier’s director of haute joaillerie Jeanne Toussaint, Cartier’s portrayal of the tiger, the largest of the cat species, was highly sought after by stylish icons and jewellery collectors. Barbara Hutton, the granddaughter of the founder of Woolworth’s retail chain, an icon of style with one of the most impressive jewellery collections of all time, was fond of tigers and preferred Cartier’s rendering of the tiger over the more iconic panther motif. 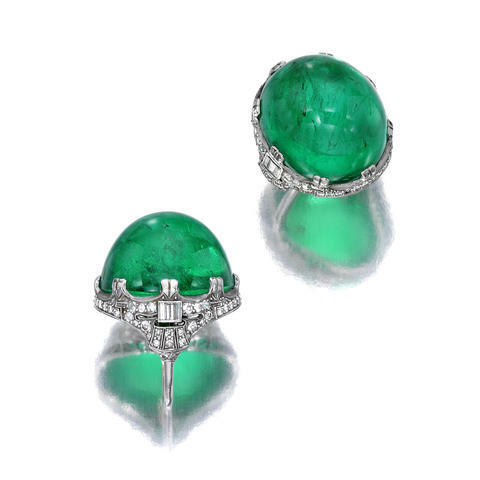 She had commissioned Cartier to create a three-dimensional clip brooch set in diamonds, carved onyx with yellow diamond strips, and a pair of earrings belonging to the prestigious Cartier Collection today, which also takes pride in the Hutton-Mdivani Jadeite Necklace which sold for an impressive $27.44 million, a new world record for a jadeite jewel, sold by Sotheby’s Hong Kong’s Magnificent Jewels and Jadeite Spring Sale this past April 2014. The craftsmanship of this Tiger clip brooch, a later version similar to the famous Barbara Hutton tiger brooch, is likewise near to perfection, the legs and tail of the tiger articulated to move with the body, the tail hanging majestically out, the body in a composed curl, with piercing emerald eyes – there is something that is magical about the tiger that even in the form of jewellery gives us protective presence. This circular jadeite disc of extremely fine quality is carved as a simplistic circle with a hole in the centre, free from intricate carvings, symbolising the modest wish for a sense of peace. It is believed that this form bears similarity to the ancient ritual object bi (璧), granting its wearer blessings from heaven. The outer and inner circles are also the perfect representation of completeness and wholeness, ideals of supreme importance in Chinese tradition. 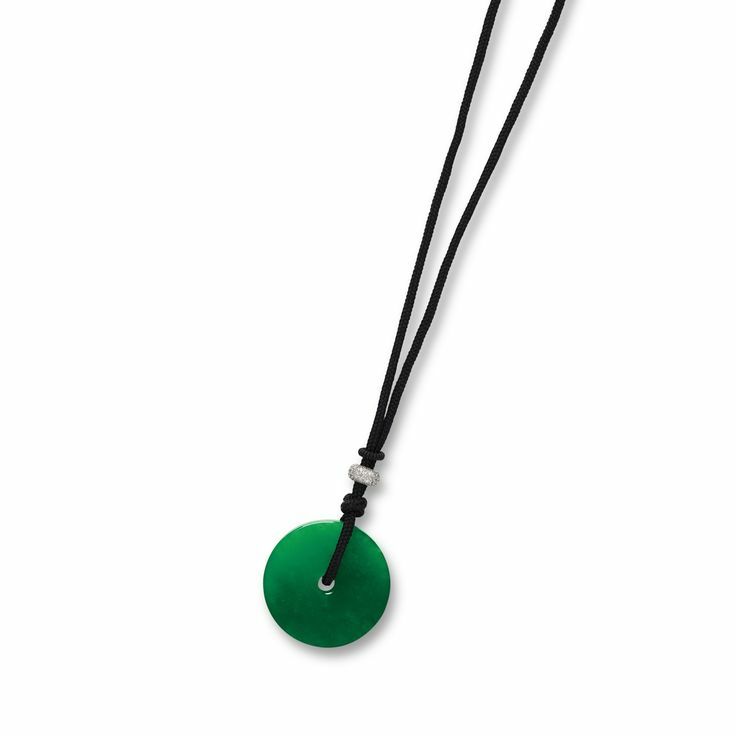 Fine Jadeite ‘Disc’ and Diamond Pendant Necklace. Est. HK$1.3 – 1.5 million /US$165,000-190,000. Photo: Sotheby’s. 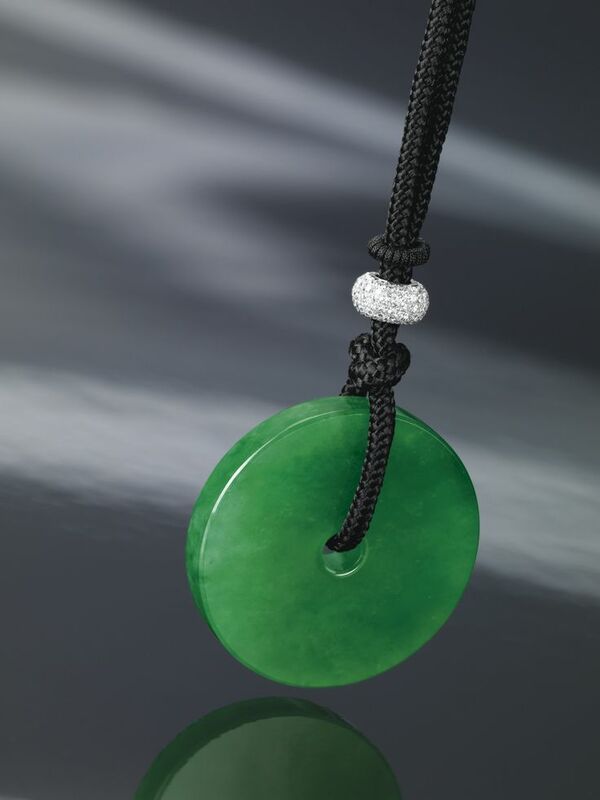 The jadeite disc of emerald green colour and fine translucency, surmounted by an 18 karat white gold rondelle decorated by circular-cut diamonds, strung on a black cord, maximum adjustable length approximately 900mm.. Disc approximately 30.71 x 4.15 x 4.97mm. Accompanied by Hong Kong Jade & Stone Laboratory certificate numbered KJ 86896, dated 13 August 2014, stating that the jadeite is natural, known in the trade as « A Jade ». This circular jadeite disc of extremely fine quality is carved as a simplistic circle with a hole in the centre, free from intricate carvings, symbolizing the modest wish for a sense of peace. It is believed that this form bears similarity to the ancient ritual object bi (璧), granting its wearer blessings from heaven. The infinite outline of the outer and inner circles is also the perfect representation of completeness and wholeness, an ideology of supreme importance in Chinese tradition. A very fine Burmese Ruby and Diamond Necklace, Composed of Unheated “Pigeon’s Blood” Mogok Burmese Rubies totalling over 50 Carats Est. HK$5 – 6 million /US$640,000-770,000. Photo: Sotheby’s. 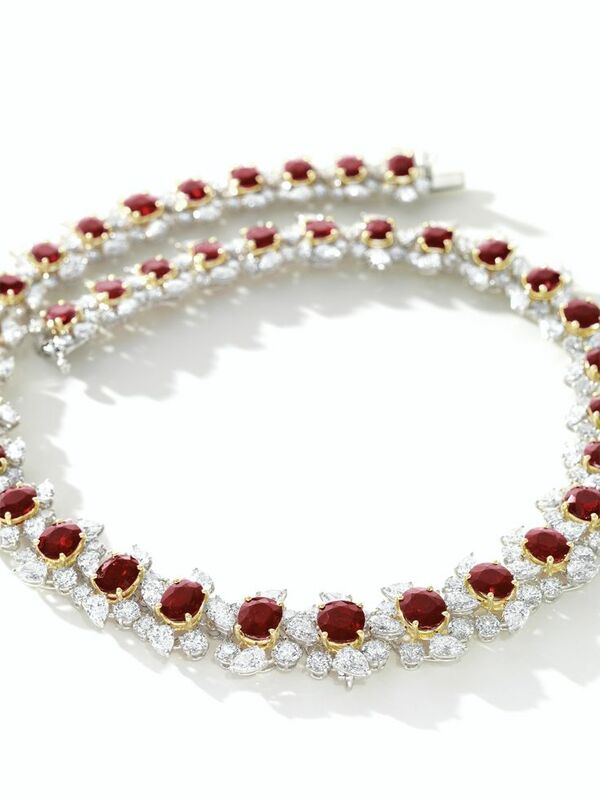 Set with thirty-seven graduated oval rubies together weighing 50.57 carats, decorated by pear-shaped and brilliant-cut diamonds together weighing approximately 42.70 carats, mounted in 18 karat white and yellow gold, length approximately 420mm. Accompanied by Gübelin and GRS reports numbered 12121037/1 to 37 and GRS2013-011474, dated 19 December 2012 and 11 January 2013 respectively, stating that the rubies are natural, of Burmese (Myanmar) origin, vivid red (GRS type « pigeon’s blood ») colour, with no indications of thermal treatment. Further accompanied by Gübelin note stating that the rubies are from the most famed Mogok Valley. A fine 4.81-Carat Colombian Emerald and Diamond Ring with No Oil Enhancement. Est. HK$1.5 – 1.8 million /US$190,000-230,000. Photo: Sotheby’s. Accompanied by SSEF and Gübelin reports numbered 68803 and 11071013, dated 25 June 2013 and 28 July 2011 respectively, stating that the 4.81 carat emerald is natural, of Colombian origin, with no indication of clarity modification. 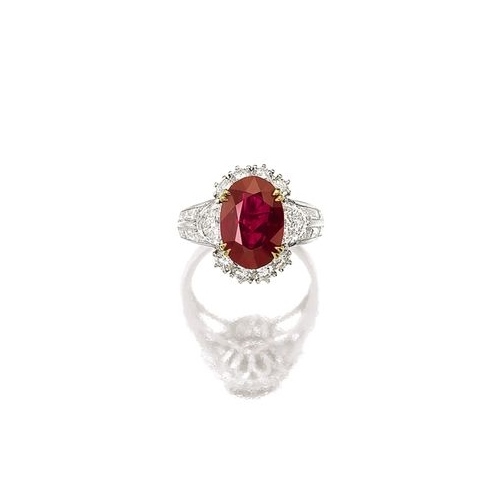 A fine 4.79-Carat Unheated “Pigeon’s Blood” Mogok Burmese Ruby and Diamond Ring, Cartier. Est. HK$2.2 – 2.8 million /US$280,000-360,000. Photo: Sotheby’s. Accompanied by Gübelin report numbered 14067250, dated 22 June 2014, stating that the 4.79 carat ruby is natural, of Burmese origin, with no indications of heating, this colour variety of ruby may also be called ‘pigeon blood red’ in the trade; further accompanied by a Gübelin note stating that the ruby is from the most famed Mogok Valley. Also accompanied by a Cartier certificate of authenticity and a signed box. 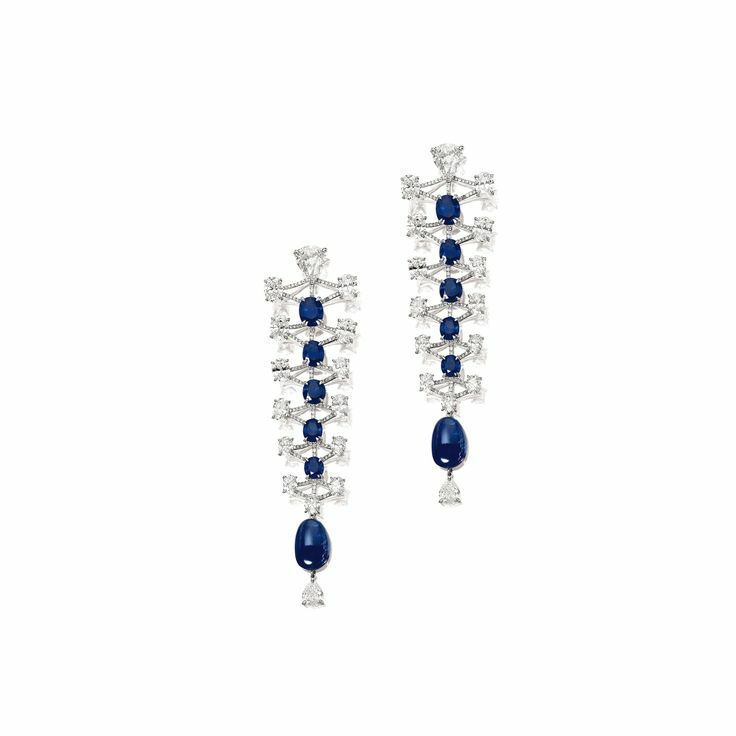 Unique Pair of Sapphire and Diamond Pendent Earrings Composed of 25.62 Carats of Unheated Burmese Sapphires in a striking Three-Dimensional Articulated Design Est. HK$800,000 – 950,000/US$100,000-120,000. Photo: Sotheby’s. Each of semi-flexible form, set with five graduated oval and cushion-shaped sapphires and a sapphire bead altogether weighing 26.52 carats, decorated by thirteen oval diamonds, anchored by two pear-shaped diamonds; the diamonds altogether weighing approximately 19.60 carats, mounted in 18 karat white gold. 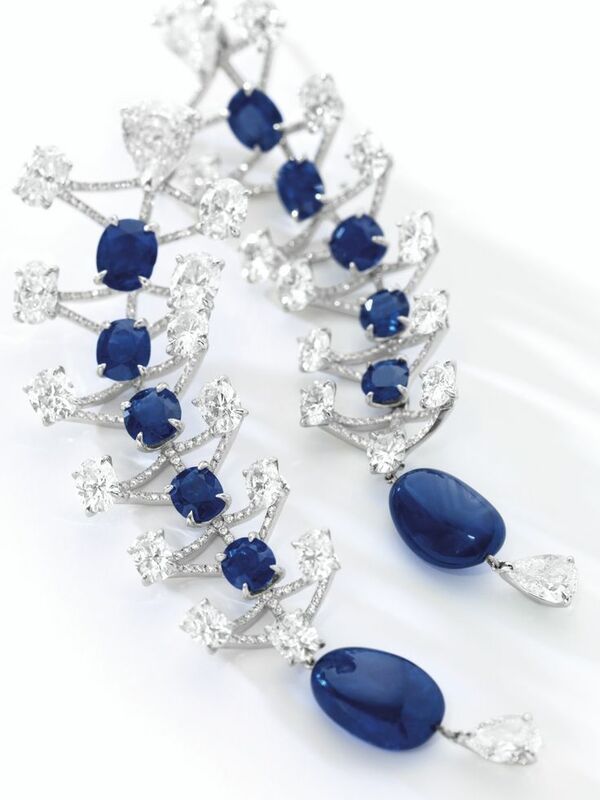 Accompanied by SSEF report numbered 76102, dated 2 September 2014, stating that the twelve sapphires are natural, of Burmese (Myanmar) origin, with no indications of heating. Also accompanied by eight GIA reports, stating that the diamonds ranging from 0.75 to 0.70 carat are D to G colour, SI1 clarity.